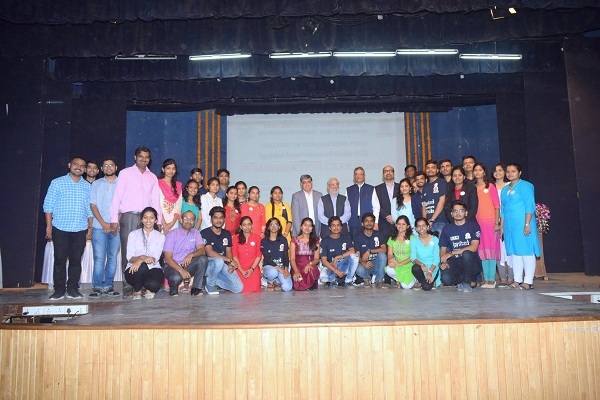 Ignited Innovators of India (i2i),a social entrepreneurship initiative for students of Maharashtra is aimed at providing a platform to students to exercise leadership in social entrepreneurship and technological innovation. In a packed auditorium at COEP, Dr. Anil Sahasrabudhe, Chairman AICTE inagurated the 10th edition of this initiative and gave a key-note address to students. He mentioed that AICTE has initiated an outdoor learning for the new students for a week wherein the students and faculty can work together and assimilation is achieved. He also mentioned about the Swayam platform that AICTE has created and that students can opt for any of the subject of their liking and earn credits. He said the interdiscilinery working will enrich the learning experience of students that can be helpful to them in the professional world. 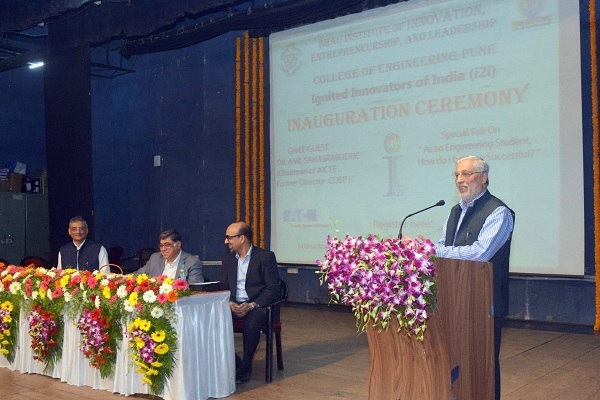 Prof. Sanjay Inamdar, member board of Governors and co-founder Bhau Institute at COEP, introduced students to i2i initiative and its role in building entrepreneurship and leadership skills. Dr. Bharat Ahuja, Director COEP explained the benefits of i2i and that of innovative entrepreneurship. Mr. Anil Gupta, Director of Innovation at EATON India shared his experince on innovation at work-place. I2I web portal was launched by Prof. B.N. Choudhari, deputy-director, COEP. The COEP auditorium was fully packed with students pouring in from different engineering colleges from Maharashtra.Faculty and students from various colleges were present in huge numbers for this ceremony. Prof. Swapnil Mali and COEP ambassadors guided the students about actual working on i2i projects. I2I project competition will be conducted in 3 phases in coming 6 months and students can register their innovative ideas having potential to solve problems related to agriculture, environment, 3H (health, hunger, humanity), education and technology.